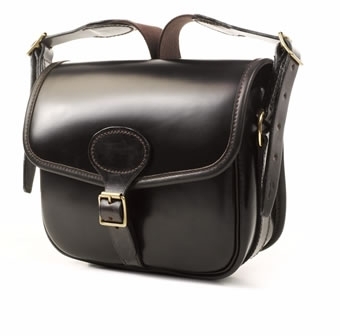 The Heath Quick Load Cartridge Bag by Brady is made from standard quality dark brown leather with suede lining and brown leather shoulder strap, flap strap and bindings. Stress points are hand stitched and the flap is hinged. The leather reinforcing strap runs around the gusset. This version will hold up to 100 shotgun cartridges.